Being a woman, I hope that the impression I leave is that of a go-getter, is that of a don’t-take-no-for-an-answer type of woman. You can make it, you don’t have to stop at the yield sign. Turn it into a green. Or step to the side, refocus your energy and keep it moving...I’ts not gonna come easy, but you have to fight for what you want. 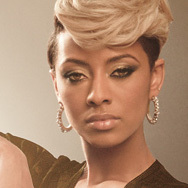 Contrary to the title of her album, "No Boys Allowed," Keri Hilson rocks out with the masterminds of science. Have you seen that gorgeous model-looking chick that’s got Usher sprung in the video for “Love In This Club?” Turns out, she’s a recording artist in her own right. Keri Hilson is about to be huge. And she’s one of those rare people who deserve to be. For Keri, music was a childhood friend she kept throughout adulthood. “In school, I would get in trouble for singing all the time. I unknowingly hummed every chance I got. It got so bad my friend’s nicknamed me ‘Keri-okey'”. She wears that name proudly on her sleeve, and in credits for every major hit she writes. Even better things happen when you get three strong, creative people in the same room. September 2008 will see the release of Keri Hilson’s first album, “In A Perfect World…” It is being issued as a joint release from Mosley Music Group (Tim’s label) and Zone 4 (Polow’s label) as an imprint of Interscope Records (Jimmy Iovine’s label). The album is about relationships, it’s emotive, human, gorgeously and deliberately imperfect. “No human is exempt from the realities of life—heartbreak, love, failure, success—I want my album to convey a sense of reality. That’s the standpoint that lent itself to the title. There will always be something you’d change if only you lived ‘In A Perfect World…’ and I’m no different.